Camping in the woods - at our Sussex campsites. Camp with a fire. Camping in the woods is easy with Eco Camp UK. We have two woodland campsites: Eco Camp at Wild Boar Wood, near Haywards Heath, and Eco Camp at Beech Estate Woodland Campsite, near Battle. 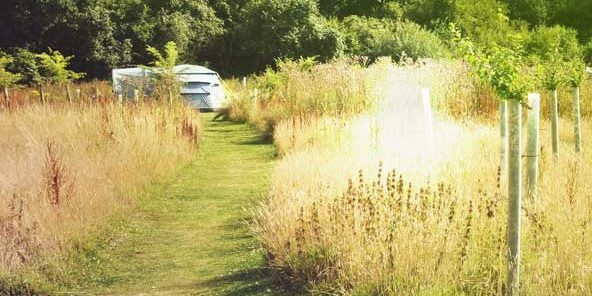 Our two off-grid Sussex campsites were designed to be in harmony with nature and to offer a place for people to go camping in the woods with all the benefits of wild woodland camping – and none of the hassle. Both of our campsites have pre-erected bell tents, where you can come and stay without pitching your own tent. Each bell tent is well-equipped with much of what you will need for your camping in the woods experience. In addition to our pre-erected bell tents at Beech Estate, we also offer pitch camping so you can bring your own tent. 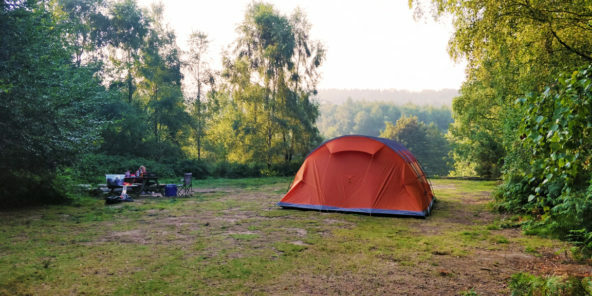 Whether camping or glamping you will have the use of our facilities which include running water, washing up areas, toilets (both composting eco loos and flushing toilets), showers, recycling bins and a fire pit at each pitch. At Wild Boar Wood, there is also a covered communal fire pit area. 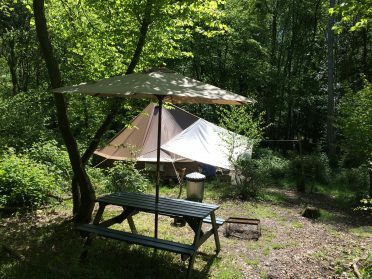 Our two sites are very different, Wild Boar Wood has just nine bell tents in a five-acre woodland while Beech Estate Woodland Campsite has bell tents and pitches for your own camping on the edge of a 600-acre woodland, but both offer all the benefits of camping in the woods. Campers can explore the woodland area, go bug hunting, wildlife watching and spend time identifying trees and plants. Den building and campfires are encouraged too. A great place to find activities for kids to complete while camping in the woods is the Woodland Trust website where their “nature detectives” area has lots of great ideas for woodland activities. In you would link more information on all of The Secret Campsites please click here.